It was hyped up all summer long and well before Cullen Bunn took over as the writer of Venom, but was Minimum Carnage worth the wait? While Minimum Carnage was only a six part arc, I am including Venom 27.1 since it deals with the aftermath as well as serving as a conclusion for this part of Venom's story. 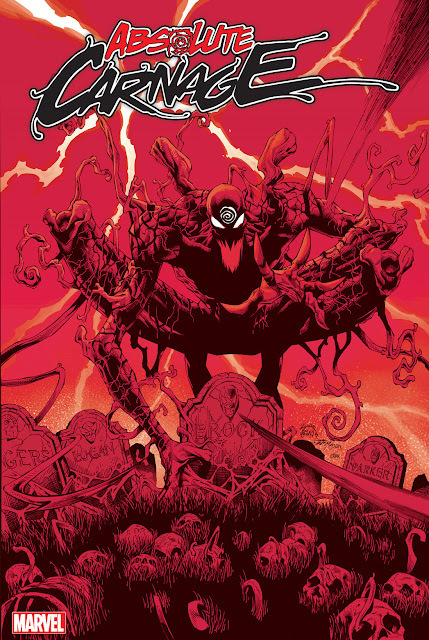 The Story: Carnage breaks out of prison and heads to the Microverse where he is hired to kill a god. 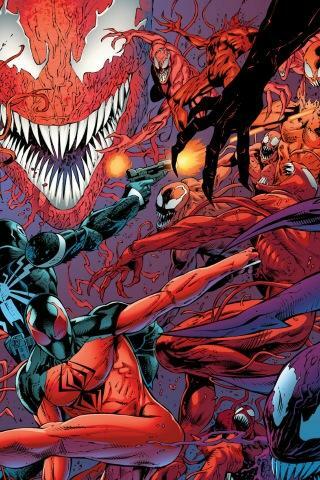 Venom teams up with Scarlet Spider and goes after him. The Good: Carnage - I loved the way Carnage was written. From his witty little nicknames ("Fake Spider-Man", "Half-Assed Venom") to his insane lust for killing. His only mission was to inflict chaos, whether that was on earth or in the Microverse. This arc stayed very true to his character. Art - Sure some of the art wasn't always the best, but each issue gave my eyes something to ogle at: Alpha - Every panel with Medina's Carnage, Part 2 - Pham's Venom losing control, Part 3 - The savage look that Shalvey gave Carnage, Part 4 - The Carnage vs SS fight, Part 5 - Venom showing he 'can do mean', Omega - Giant Carnage, 27.1 - Every freaking panel of Checchetto's art. While you might not agree, the different art styles were definitely the highlight of this arc. The Bad: Mistakes? - It feels like mistakes were made (some probably intentional) just for the shock value. The decapitation of Carnage should in fact kill Cletus, correct? Did the symbiote actually grow him a new set of legs because of their bond, or was this an over sight by the artist because it wasn't mentioned anywhere in the actual books? Why does Cletus's hair change from red in the first issue to blonde in the finale (even his face looked nothing like the Kasady I know)? The Microverse - I know nothing about this world. All of my previous knowledge came from a wikipedia search I did prior to the event. I didn't know the rules, so when Carnage just slipped through the floor or our heroes were simply teleported back as miniatures, I had to accept it and move on. There isn't exactly anything wrong with The Microverse, it was just a turn off because of my ignorance. The Overall: 3.5 outta 5. I did enjoy this arc as well as learning more about Scarlet Spider. I can't say I liked what happened to Carnage. No one can replace Cletus (some said the same about Eddie though) and still have Carnage. It will be interesting to see how it all plays out, I'm just not a fan of it right now. Since Remender left, if felt like this arc was forced because it felt more like his style of Venom then Bunn's current style (see issue 27.1). Minimum Carnage was definitely better than Maximum Carnage, but I am still going to wait until 2043 for the release of Median Carnage!